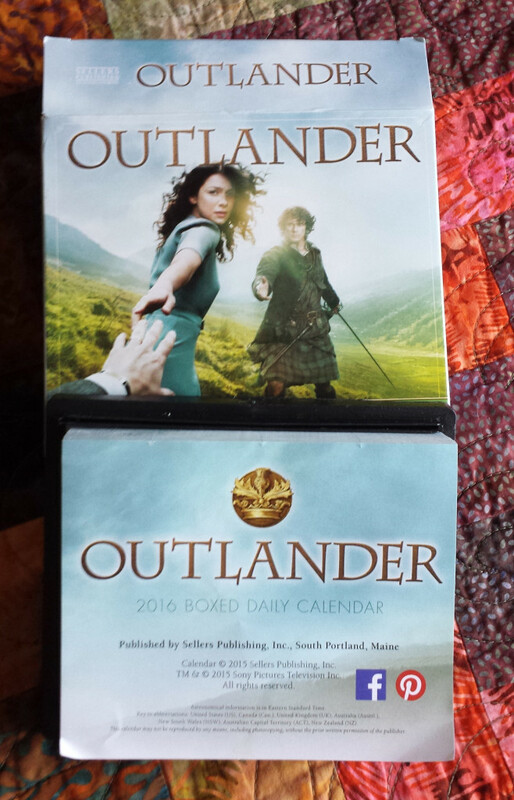 The 2016 boxed, daily calendar for Outlander just started shipping out from Amazon this week. Rather than show you photos of some of the 365 pages of the calendar, I made a video to give you a better look at what you get with your purchase. I purchased this calendar from Amazon for less than $9, but the price has increased to $13.49 at the time of this post. It might be worth waiting to purchase it when the calendar is cheaper, as the retail price is $14.99. This calendar should be available to purchase in the U.S., Canada, Australia, and New Zealand. I would encourage you to seek out online retailers or larger bookstores to see if they will carry it. It is still pretty early to be purchasing a 2016 calendar, so just because you can’t find it now, that does not mean that it won’t eventually be available. As pointed out in the video, it does have photos from the entire first season of Outlander, not just the first half like the monthly calendar. Click here to purchase the calendar from Amazon. This entry was posted in Not Really News But Still Worth It! and tagged Calendars, Merchandise by Sarah Ksiazek. Bookmark the permalink.